Another high graphic and top quality video slot machine available at Playtech online casinos. This game has 5 reels and 25 paylines and a brightly coloured symbols that show the story of the beautiful Esmeralda, immortalised in the story by Victor Hugo, The Hunchback of Notre Dame. 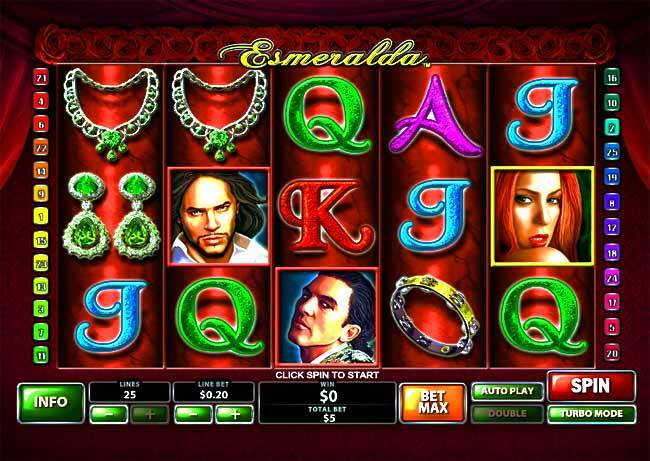 The game offers a progressive jackpot, which is struck by getting 5 ESMERALDA symbols on an active payline. Other symbols include J, Q, K and A, along with emerald jewellery and musical instruments. The top symbols pay up to 1000x the line bet. Play this online slots game free on our demo version below.. The main symbols are the JACKPOT symbol, 5 of which will award 15,000x your bet, this symbol is also the WILD symbol so is worth a lot. And the ROSE scatter symbol which whic brings the big rewards. The rose scatter symbol can be stacked on all reels. 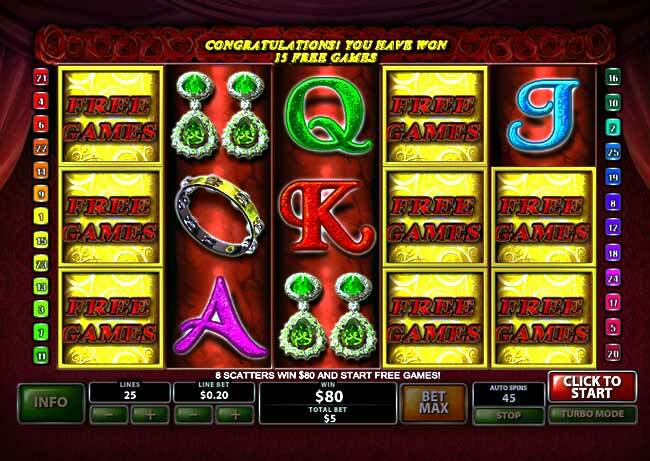 Get 5 or more symbols to double your money, when you hit 8 or more scattered roses you will start the FREE SPINS bonus. 8 Roses awards 16x total bet plus 15 FREE GAMES. The more scattered roses the better, if you get all 5 reels stacked with roses you are onto a real winner with 30x your total bet and a massive 70 FREE SPINS!!! The other real bonus about this game is that even during your free spins you can still spin the ROSE scatters and win big money and increase your free spins indefinitely. A real great game with the potential for a huge payout.